Provide comfort for the family of Ryker Flynn with a meaningful gesture of sympathy. 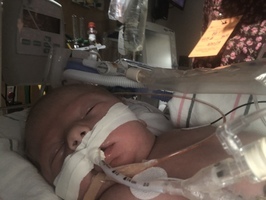 Ryker Ray Flynn, one day old, passed away Wednesday, March 20, 2019 of a congenital heart defect at IU Health Riley Hospital for Children. 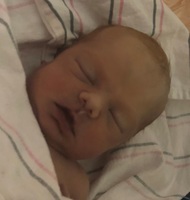 Born Tuesday, he was the son of Cory and Brandi (Hall) Flynn. Survivors include his parents, two brothers, Kamdyn Brown, Ayden Flynn, maternal grandmother, Sherry Hall (Ron Fields) of Bedford, paternal grandparents, Jeff and Chris (Welsh) Flynn of Bloomington, great-grandmother, Thelma Flynn, great-grandfather, Bill Turner, several aunts, uncles, and cousins. Ryker was preceded in death by his maternal grandfather, Michael “Pops” Hall, great-grandparents, Chuck and Mary Kay Welsh, great-grandmother, Norma Kinser, and uncle, Rick Flynn. Funeral services will be 3:00pm Friday, March 22, 2019 at The Funeral Chapel of Powell and Deckard, 3000 E. Third St. in Bloomington. Pastor Mickey Smith will officiate. Burial will follow at Clear Creek Cemetery. Visitation will be 2-3pm Friday at The Funeral Chapel. In lieu of flowers the family requests contributions be made to The Funeral Chapel. We encourage you to share your most beloved memories of Ryker here, so that the family and other loved ones can always see it. You can upload cherished photographs, or share your favorite stories, and can even comment on those shared by others. Dear Flynn family, Please accept my deepest condolences. Revelation 21:3,4 says- “And he will wipe out every tear from their eyes, and death will be no more, neither will mourning nor outcry nor pain be anymore. The former things have passed away.” Soon this promise will become a reality. You can have firm faith it.